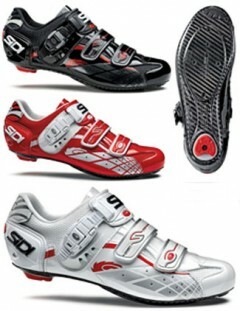 New for 2010 is Sidi’s Laser Vernice road shoe. The upper is made from Vernice Mircrofibre with your foot firmly kept in place thanks to the High Security Velcro straps and the Soft Instep Closure system with the Caliper buckle. Vernice Microfibre: It is a synthetic material that allows dirt to slide away thanks to its smooth surface. Clean with water and mild soap and towel dry, do not expose to heat. Use of alchol or abrasive cleaners is not recommended as this would damage the surface coating. Soft Instep Closure System: The wide, anatomical and padded strap has been reduced and coupled to soft, thermoformed material increasing comfort and performance. It distributes pressure evenly over the arch area, adjustable from both sides for perfect centering. The system elimates the need for the High Instep Extender. Used with SL and Caliper buckle straps, which are serviceable and replaceable. Caliper Buckle: The micrometric closure called Caliper buckle is regulated by lifting the central buckle. In order to completely open, lift together both sides buckles, while to slightly loosen the closure during the race the central clip must be pushed down. High Security Velcro: The high security straps with integrated locking polymer teeth engage onto each other when the strap is closed. This feature makes the closure more secure and the strap becomes unmoveable. Sidi Heel: The reinforced heel keeps the foot in position and avoids the shoe being deformed by extreme performance or prolonged pressure. The Carbon Sole provides a slight amount of flex while retaining excellent stiffness and power transfer in the body of the shoe. The sole includes an anti-slip insert at the toe and has an replaceable rubber heel pad. The Carbon Sole is compatible with the Look Keo Memory Cleat.